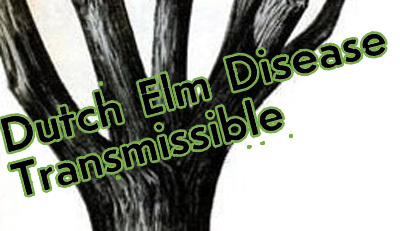 April 1, 1973: BBC Radio broadcast an interview with an elderly academic, Dr. Clothier, who discoursed on the government's efforts to stop the spread of Dutch Elm Disease. Dr. Clothier revealed that some startling discoveries had recently been made. For instance, he referred to the research of Dr. Emily Lang of the London School of Pathological and Environmental Medicine who had found that exposure to Dutch Elm Disease immunized people to the common cold. Unfortunately, there was a side effect. Exposure to the tree disease also caused red hair to turn yellow and eventually fall out. This was attributed to a similarity between the blood count of redheads and the soil conditions in which affected trees grew. Therefore, Dr. Clothier warned that redheads should stay away from forests for the foreseeable future. Dr. Clothier was in reality the comedian Spike Milligan. April 1, 2012: The British Library, on its Medieval Manuscripts Blog, announced the "near-miraculous" discovery in its archives of a long-lost medieval cookbook that included a recipe for how to cook a unicorn. "Taketh one unicorne," began the instructions, and then marinade it in cloves and garlic before finally roasting it on a griddle. The cookbook even included hand-drawn illustrations, which the library reproduced, showing exactly how the unicorn should be grilled. The compiler of the cookbook was said to be one "Geoffrey Fule," who worked in the kitchens of Philippa of Hainault, Queen of England from 1328-1369. #83: Why Doesn't America Read Anymore? 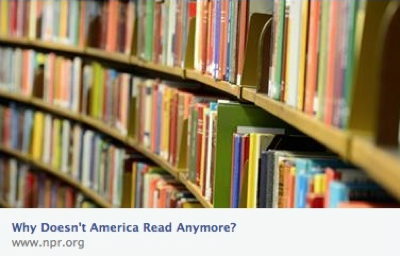 April 1, 2014: On its Facebook page, NPR News shared a link to an article with the provocative title, "Why Doesn't America Read Anymore?" The link generated hundreds of comments. Some agreed with the premise. Others disagreed. But what the responses shared in common was that the people who posted them had unwittingly demonstrated the relevance of the question by failing to take the time to click on the link and read the article. If they had, they would have discovered a short paragraph stating, "We sometimes get the sense that some people are commenting on NPR stories that they haven't actually read. If you are reading this, please like this post and do not comment on it. Then let's see what people have to say about this 'story.'" 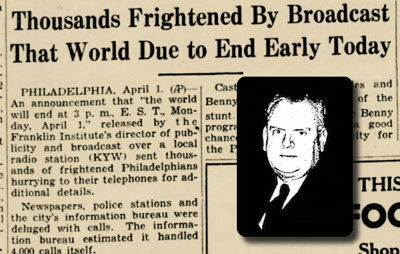 March 31, 1940: Philadelphia's Franklin Institute issued a press release declaring that the world would end the following day. The release was then picked up by radio station KYW whose announcers told their listeners, "Your worst fears that the world will end are confirmed by astronomers of the Franklin Institute.... Scientists predict that the world will end at 3 P.M. Eastern Standard Time tomorrow. This is no April Fool joke." The public reaction was immediate. Local authorities were flooded with frantic phone calls. The panic only subsided after the Franklin Institute repeatedly assured everyone that it had made no such prediction. The prankster responsible for the press release turned out to be William Castellini (pictured in inset), the Institute's press agent. He had intended to use the fake release to publicize an April 1st lecture at the institute titled "How Will the World End?" Soon afterwards, the Institute dismissed Castellini. 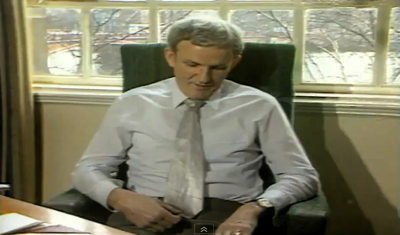 April 1, 1985: ITN News reported that the British Department of Energy, as part of its ongoing effort to help companies save money by reducing office heating bills, had developed a thermally insulated tie. "Our research," the DOE's Chief Scientist Dr. Derek Pooley explained, "has discovered that heat loss from the body is particularly important in the front of the chest, and this thermally insulated tie is to prevent heat loss from that part of the body." The DOE predicted that if office workers were to wear these "thermal ties," British companies could save up to £5 million annually on heating bills. Conservative MP Anthony Beaumont-Dark subsequently reprimanded the DOE for participating in the spoof news video, noting that such pranks were "OK for the music hall, but we do not expect this type of thing from government departments." 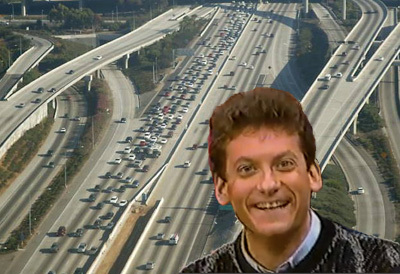 April 1, 1987: LA disc jockey Steve Morris (pictured) announced on KRTH-FM that freeways in Los Angeles and Orange counties would be closed for major repairs from April 8 to May 1 so that road crews could work nonstop. Morris discussed the news throughout his morning show, from 6:30 to 9:30 a.m., until finally he announced, "April Fool!" But long before he revealed the joke, his announcement had spread panic throughout L.A., where the freeway is an unavoidable part of daily life for most people. The radio station, Caltrans, and the California Highway Patrol were all flooded with calls. KRTH later admitted that it was stunned by the reaction to the hoax and noted that it had received a call from Caltrans informing them that "they didn't think it was very funny." April 1, 1950: Motorists driving along the scenic Rim of the World highway near Lake Arrowhead in Southern California encountered something remarkable. 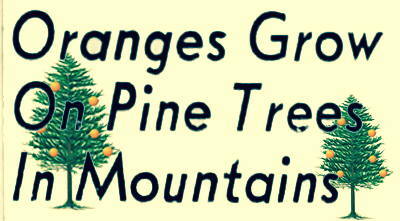 All the pine and cedar trees lining the road had grown oranges overnight. The transformation turned out to be the work of the residents of the nearby town of Skyforest, led by the cartoonist Frank Adams. They had crept out during the night and strung 50,000 oranges in the trees along a one-mile section of the highway. The fruit was left over from the recent National Orange Show in San Bernardino. 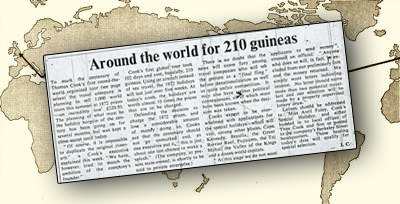 April 1, 1972: In honor of the 100-year anniversary of Thomas Cook's first round the world travel tour, the London Times ran an article about Cook's 1872 tour, in which it noted that the vacation had cost the participants only 210 guineas each, or approximately $575. A few pages later, Times readers then found a small article noting that in honor of this anniversary, Thomas Cook was running a promotion, offering the chance to buy a similar package deal at 1872 prices. The deal would be given to the first 1000 people to apply. The only clue that this was a joke was the remark that applications should be addressed to "Miss Avril Foley." The response to this bargain-basement offer was swift and enthusiastic. Huge lines formed outside Thomas Cook offices, and the travel agent was swamped with calls. The Times subsequently issued an apology and dismissed the reporter who had written the article, though he was later reinstated. April 1, 1995: For hundreds of years, the gondolas of Venice have been colored black — and only black. According to legend, this is because after the plague struck Venice in the sixteenth century, it was decreed that all the gondolas had to be black as a tribute to the victims. 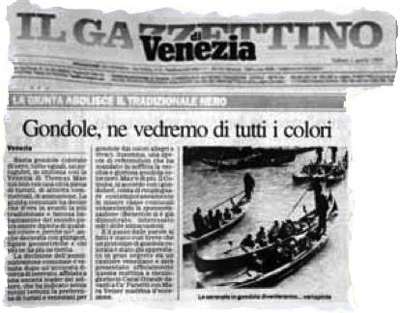 Therefore, massive shock and outrage was triggered by an announcement on the front page of Il Gazzettino Venezia that the city council had decided that all the gondolas should henceforward be colorized, not only with bright shades of red, yellow, blue, and green, but also with swirls and geometric shapes. The city council, the paper said, made this decision after conducting "thorough market research on the tastes of tourists and Venetians," which had determined that people were tired of seeing "dismal" black boats plying the canals of Venice. 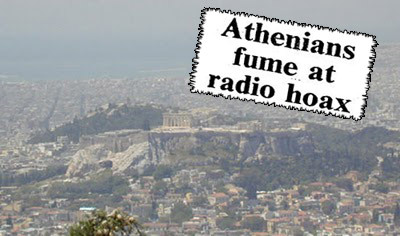 April 1, 1982: Greece's state-controlled National Radio Network issued a warning that pollution had reached emergency levels in downtown Athens, and that the city would have to be immediately evacuated. All schools were called upon to close, and the children to be sent home. Furthermore, anyone driving a car was asked to abandon it and flee to open ground. Since pollution in Athens was (and still is) a serious problem, thousands of people took the broadcast seriously and began to leave the city. Within three hours the Radio Network retracted the warning, revealing it to be a joke, but by then the damage had been done. One man sued the network for $820,000, claiming the prank had caused him mental distress. The director of the network submitted his resignation over the incident, and the originator of the hoax was fired.